For the first time at a British election, the three main party leaders are engaged in a series of televised debates, modelled on the debates held in US presidential elections. That makes it far easier for the Liberal Democrat Nick Clegg to get his audience. During those debates, Clegg's poll ratings have risen to the point where many are considering the possibility of a Liberal Democrat role in Government. This must be seen in front of an old-fashioned parliamentary system where a so-called "first-past-the-post" electoral system is employed in elections. The name being derived from horse racing means nothing else but: That candidate receiving the highest number of votes among his competitors will be declared the winner. As a consequence, the governing party tends to enjoy a large majority in the House of Commons, and there is often limited need to compromise with other parties. That's why the word "coalition government" seems to be unknown in Britain. Unlike Germany and other European countries, where single-party-governments are rare to be found, Britain's most recent history can be characterized by a constant change between pure Labour and pure Conservative governments. Getting back in time to the years before 1830, when conservative "Tory" governments changed with rather liberal "Whig" governments, it seems that almost nothing has changed since. Furthermore, modern British political parties are so tightly organised that they leave relatively little room for free action by their Members of Parliament. In many cases, MPs may be even expelled from their parties for voting against the instructions of their party leaders. During the 20th century, the British government has therefore lost confidence issues only three times — twice in 1924, and once in 1979. After World War II, the Liberal Democrats declined to a party of political outsiders, unable to mobilize masses of voters, and I remember one Liberal MP out of a handful of Liberal members of parliament who once led our group of German schoolmates through the Houses of Parliament, telling us about the "Whigs", his party's predecessors, who once enjoyed much political influence in Britain. Now again, the Liberals are "on the go", not only due to modern politics but, as well, because of mass media deliberately serving as a platform for the exchange of ideas and opinions. Its just like U.S. President Obama wrote about his years as a Senator: You can persistently travel around your state and attend as many townhall-meetings as possible, but you will never reach that degree of publicity or popularity that you can reach by the means of one single TV spot on a national level. A similar result after the first and second debate had been discussed some days before between a leading member of the Liberal Democrats and Al-Jazeera's David Frost in another edition of "Frost over the World" where the tough questions are put. 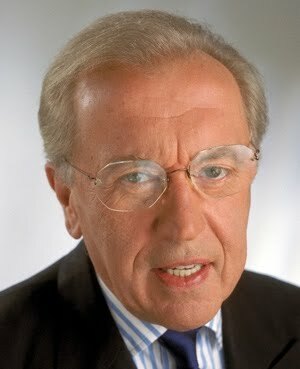 Sir David Frost is a British journalist of repute who knows most British leaders personally and who joined the international program of Al-Jazeera almost from its beginning. Last minute information: Prime Minister Gordon Brown made a mistake that could cost him more than one vote. On his campaign he was adressed by an elderly lady on the immigration subject. Back in his car, he murmured some insult into his beard, oblivious to the fact that his microphone was still switched on. Thus, all listening journalists could proliferate this story [Picture taken from CNN video]. Daily Mail's warning: Vote decisively to avoid a "hung" paliament where no single party has the majority [May 5, 2009]. The Sun: Something like "Britain's got talent to change" but avoid "hung" parliament [May 5, 2010]. Pro-Labour Daily Mirror: The rifles of those Tory guys from Eton college will target social benefits [May 5, 2010]. The Times: Citing Prime Minister Gordon Brown's "Better rely on Labour" [May 5, 2010]. Today, Al-Jazeera published a special report proving that Taliban fighters are now in control of Korenghal Valley in Afghanistan's Kunar province after U.S. troops left their military base some days ago. 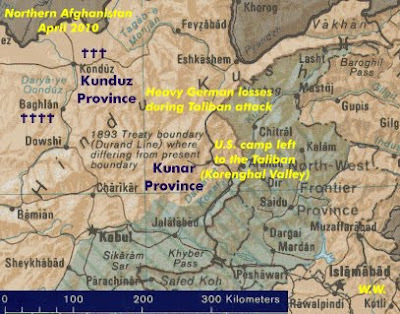 While U.S. military are calling it a tactical action in favor of a troop concentration in more densely inhabited areas, the Taliban are calling it a defeat. It seems that U.S. troops never succeeded to fully control an important road needed for their supply. By the way, the Korenghal Valley has become known among U.S. soldiers as the "Valley of Death" according to those 42 servicemen who died here during the last five years. Even though U.S. military blew up some of their equipment, there are still lots of ammunition and tons of fuel left to serve the Taliban who are now decided to use that base in their fight against foreign troops. "Wherever the foreigners go, we'll follow to fight them", is what the Taliban say. And one inhabitant of a nearby village put it that way: "We don't want American or German troops. We don't want any foreigners. All we want is peace. All we want is the Taliban and Islam." Count Down for a Nuclear Showdown ? Each time Wolf Blitzer is reporting from the CNN "situation room" the world can be sure to meet with an unpleasant situation. This time its fresh information about Iran's nuclear program. According to Pentagon officials questioned by members of the Senate, Iran should now be able to present weapon's grade uranium within one year and a ready assembled nuke within three to five years. We don't know whether that estimation has the truth or not, yet we are even more concerned when we get the news of Syrian Scud missiles being handed over to Hezbollah, one of the most radical enemy organizations opposing Israel. It seems as if those Scud missiles are intended to hit Israel prior to an Israeli assault on Iranian nuclear facilities.